'Koenig Laurin' (Wolfgang Landgraf, R. 2003). Seedling #WL 264/1, MDB, 6 1/2" (16 cm). Midseason bloom. 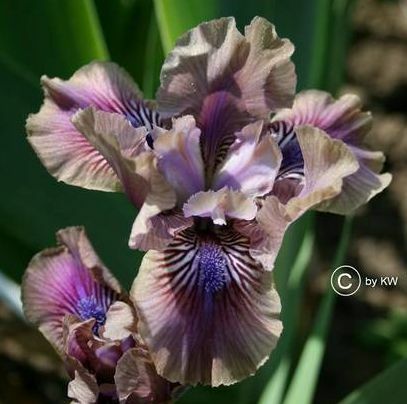 Standards brownish violet; style arms light violet, darker midrib; falls brownish violet veined aubergine, darkest around beard; beards blue, brownish in throat; slight fragrance. 'Stormy Circle' X 'Celsius'.